Complete Business Interiors & Workplace Solutions. One Interior at a Time. Fusion Projects is a design-build company which provides businesses in the lower mainland with a unique new option for creating complete business interiors and workplace solutions. From Project Management and Design through to Move Management, Fusion has managed some of Vancouver’s most prestigious and unique projects. 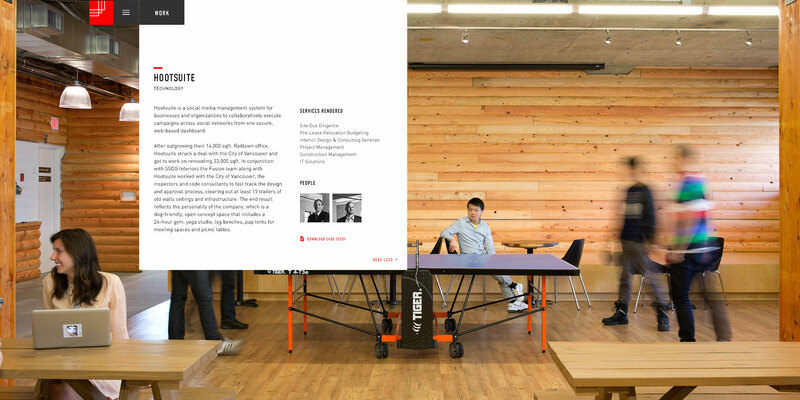 Their client’s include, G&F Financial Group, Sony, Intrawest, Fiat of Vancouver, and Hootsuite. Seeking a more modern look while retaining the recognizable aspects of the Fusion brand, the new corporate identity combines the past with the present. As Nicholas Boyd, Fusion Projects’ President puts it, “This rebranding is a reflection of our one of our most important goals: striving to preserve the old, while embracing the new, which is accomplished through redevelopment and restoration of existing properties. This vision is further developed through our new website, which allows us to focus on the stories that our projects tell, both about our clients and our company,”.